Most Wednesdays during the growing season I go to the Green City Market in Lincoln Park. It is, of course, where I shop for fruits and vegetables. But I also like to go to the free chef demonstrations that the market hosts. Because these take place on Wednesday mornings, the crowd tends to be mostly retirees, a few people with babies or young children, and, uh, me. Being neither a retiree nor a parent, I sometimes feel conspicuously out of place. But I stick around because I get free food from awesome chefs, and I get to watch them in action, observe their knife skills, get a sense of their approach to cooking, and pick up kitchen hacks along the way. Because these take place in the great outdoors under a flimsy tent with a couple of folding tables and a couple of gas camp stoves as the only source of heat in Chicago’s notoriously unpredictable weather, it’s sometimes an object lesson in frustration. A few weeks ago when Cameron Grant from Osteria Langhe was doing a demonstration, the wind kept blowing out the flame on the stove, almost ruining the risotto (luckily, Chef Grant was able to get enough flame to save it). Some chefs who have done plenty of these demonstrations, like Andrew Zimmerman (whose cucumber kimchi I recently shared), have said they won’t do anything that requires actual cooking at these things anymore, opting instead for salads and similar no-heat sorts of dishes, because it’s not worth the hassle. But I always look forward to demonstrations from caterers. They always, always nail these demos because creating beautiful food for lots of people in just about any setting is in their wheelhouse. While most of the restaurant chefs are sort of winging it on the serving side, bringing out a stack of paper plates and figuring out tasting portions as they go, the caterers tend to come with serving staff equipped with trays, beautiful disposable dishes and flatware. And they’ll even come around and take away the trash for you instead of leaving you to find the compost/recycling/garbage station at the other side of the market. I’ve come to appreciate that it takes a special skill set to be able to pull that off. It’s one thing to cook in the comfort of your own home, even for a big party, and another thing to be able to figure how to prepare and transport beautiful and delicious food to work in a place that doesn’t have a proper kitchen on site. Today’s roasted heirloom squash and tart apple soup is adapted from one of those caterer’s, Chef Molly Brewe of Limelight Catering. After I tasted it at her demonstration, I couldn’t get it out of my mind. 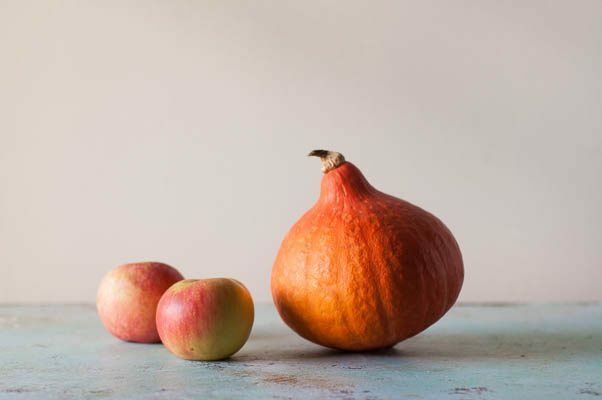 It’s a great autumnal soup that balances the sweetness of heirloom squash with the tartness and acidity of apples. 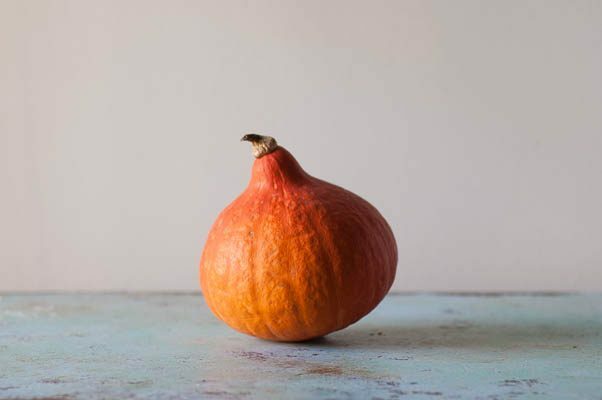 It works with just about any hard winter squash–butternut, Kabocha, acorn, delicata, carnival. I used one of my all-time favorites, red kuri squash, in this, but you can use whatever squash you like. The apples should be something on the tart side. I used empires, but any tart apples will work (avoid the sweeter varieties like golden delicious or macintosh for this or the soup will be too sweet). It’s a smooth soup with a velvety texture. And while it has a moderate amount of half and half included to round out the flavors, it doesn’t feel at all like you’re eating a bowl of heavy cream. I’m sure you could get away with whole milk or an unsweetened nondairy milk (coconut milk would be my first choice) or even leave it out altogether if you wanted to. It gets topped with a dollop of tangy creme fraiche, crunchy spicy maple pepitas, and bright green chives for added textures, flavors, and visual interest. It’s lovely, balanced, and perfectly autumnal. Exactly the sort of thing I want to eat when the weather turns crisp. 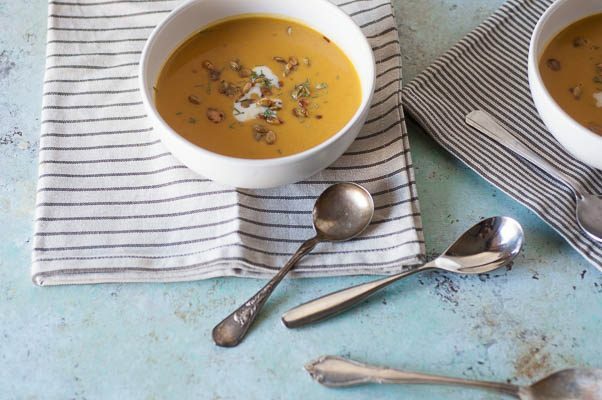 I love the way this soup balances sweet squash and tart apples. It’s a marriage of two of fall’s most iconic vegetables and fruits, and it really works. Use any orange-fleshed winter squash you like. Red kuri is one of my favorites, and it’s what I used here, but butternut, Kabocha, delicata, acorn, carnival would all be good here as well. Choose a tart apple for this–empire was my choice. This can be made with either chicken or vegetable stock, and it’s vegetarian if you use the latter (I’ve had good experience with the Swanson brand for both chicken and vegetable stock). I highly recommend making the spicy maple pepitas–they add a great crunchy texture to the soup. This soup is gluten free as is. If you avoid dairy, you could swap in olive oil for the butter, coconut milk for the half and half, and skip the creme fraiche garnish (then the soup would be vegan). This calls for 5-6 cups of stock. I know most stock comes in 4-cup packages–feel free to use 4 cups of stock and add water for the rest of the liquid. This freezes well, but squash soup that’s been frozen tends to think out a little after it thaws. If you plan to freeze this, make it slightly thicker than you want it so you have the right texture later. Oh, and while you can do this in a standing blender, it’s so much easier with a stick blender. Preheat oven to 400°F. 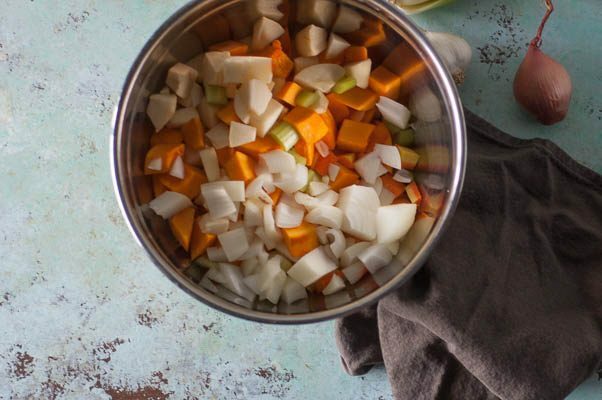 Toss the squash, onion, carrot, celery, and apples with olive oil and a sprinkle of salt. Spread in an even layer on a half sheet pan and roast until everything is tender and the squash and onions are beginning to caramelize, about 45 minutes. Remove from oven (but leave the oven on). In a large sauce pan or stockpot over medium heat, add the butter, garlic and shallot and saute until tender, about 5 minutes. Add the roasted squash and apple mixture, ginger, curry powder, and stock. Bring to a boil, turn heat to low, and simmer for about 15 minutes. Meanwhile, make the spicy maple pepitas. 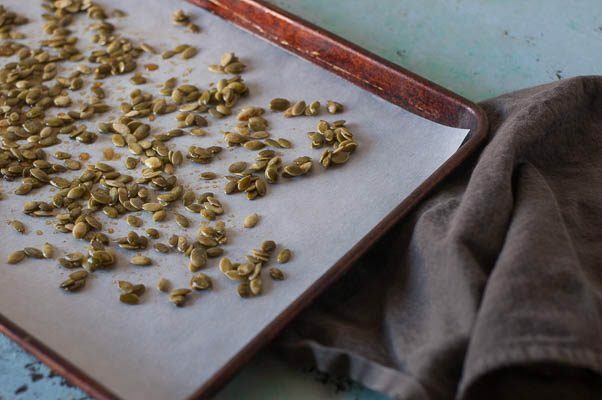 Mix the pepitas with olive oil, maple syrup, cayenne, and salt and spread in a thin layer on a sheet pan. Roast until crisp, about 8-10 minutes. Let cool. Return to the simmering soup. 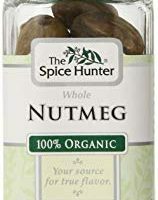 Add cayenne, nutmeg, and half and half. Puree with a stick blender (or transfer to a standing blender and puree) until smooth. Taste and add salt and pepper if desired. If the soup is too thick, add water or stock until it reaches your desired consistency. Ladle into bowls and garnish with a dollop of creme fraiche, spicy maple pepitas, and chives. 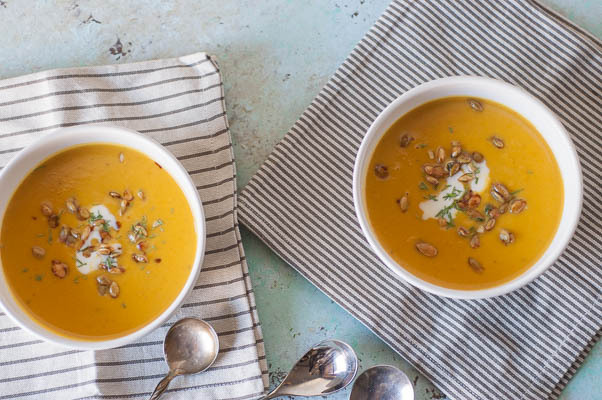 Apple in a squash soup sounds great – and makes seasonal sense! Love it! Thanks, Paul! I think it’s a combination that really works. Sounds delicious! 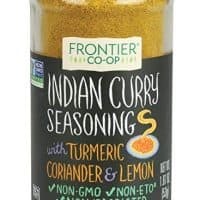 I love that this has apples in it too –such a good combo with the squash (I have made a squash apple based soup in the past). And now I’m heading over to check out your cucumber kimchi post too : ) Pinned! 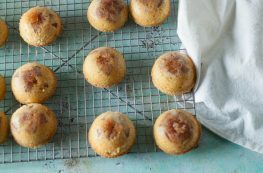 This recipe looks so good, I hope to try it soon! For those of us who are lazy, Trader Joes sells amazing spiced pumpkin seeds that would be a great garnish to speed up cooking time (but yours look better, obviously). I am so getting ready for soup season! I have no problems drinking soup every night. I just love the idea of mixing different ingredients in a pot. Thanks, Christine! Soup season is such a comforting time, isn’t it? 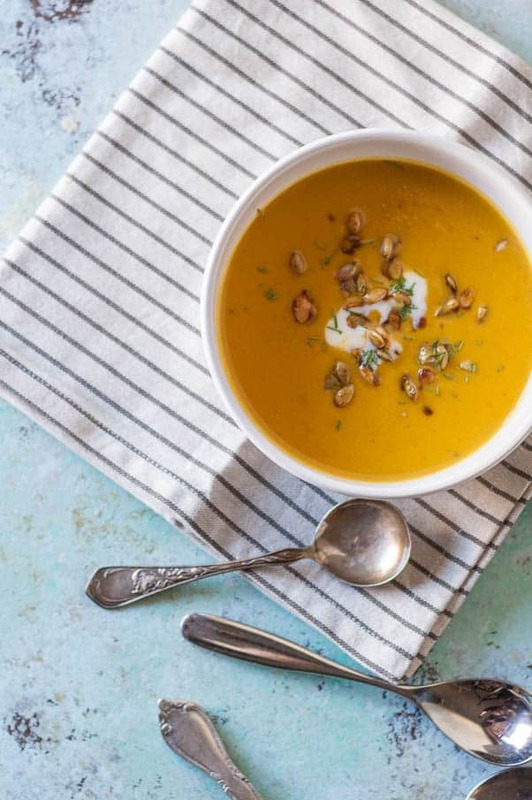 I have never thought to combine squash and apples into one soup, but this looks so good! I think I might just have to try making this! Thanks, Brittany! I think the sweetness of the squash and the tartness of the apples work really well together. I hope you give it a try. Thanks, Lyndsay! Let me know how it turns out. Thanks, Joanna! I hope you love this one, too! 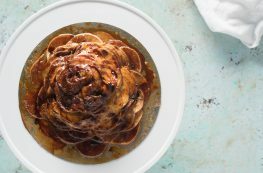 Beautiful photos and this recipe looks lovely!! Fall soups are some of my favorites and this sounds right up my alley. Thanks for sharing! Thanks, Erica! I love fall soups too! 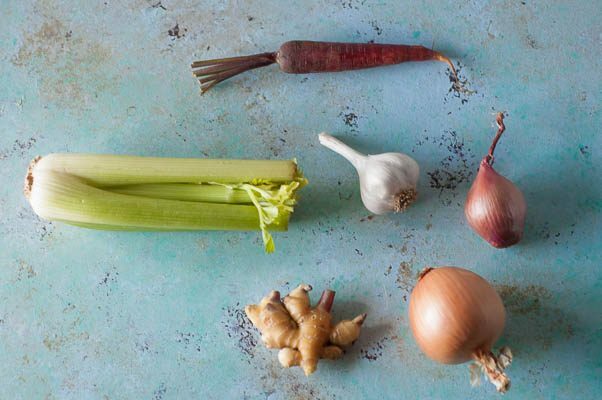 So excited to see many nutritious ingredients mixing in this beautiful soup. Perfect for this fall.